Imagine that George, the student in the inner circle of Figure 1 (below), is a fourth grader in an immersion program. George has grown a bean plant from a seed in his science class. His task is to write a paragraph in the target language about the effects of sun and water on plant growth. George considers the task, his skills, his resources and how he can use them to complete the assignment. He plans to write an outline before he writes the paragraph. After he writes the outline, he reads over it to see if it makes sense. He finds that he needs more vocabulary words to express his ideas so he looks up new words in a dictionary. Finally, George evaluates his paragraph, decides that he is satisfied with his work, and hands in his paragraph. This is a profile of a successful language learner. George employed a variety of meta-cognitive and task-based learning strategies he has been taught to successfully accomplish the task. He is able to manage his own learning effectively and efficiently through the use of learning strategies. Since its inception in 1990, the National Capital Language Resource Center has conducted extensive research on language learning strategies, led by Dr. Anna Uhl Chamot, learning strategies expert and co-author of the CALLA1 framework. This research resulted in the publication of the Elementary Immersion Learning Strategies Resource Guide, a guide to incorporating learning strategies into an existing immersion curriculum in grades K-6. The resource guide was written on the premise that all students can achieve high standards if they are provided effective learning tools and instructed on how to use them. These effective tools are learning strategies—the mental processes and actions students can use to help comprehend, produce, remember, and manage learning tasks. 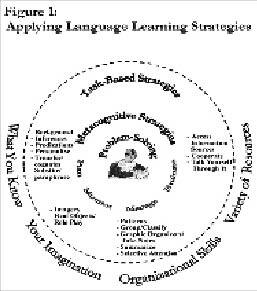 Learning strategies instruction provides a means of improving students’ acquisition of a second language. Their ability to use strategies flexibly and to match them appropriately with tasks has broad implications for learning both content and language. The free, online guide includes chapters on teaching learning strategies; selecting which strategies to introduce to students in language and content areas at each grade level; sample lessons; a model for developing a learning strategies lesson; learning strategies lists and definitions in English, Arabic, Chinese, French, German, Japanese, Russian, and Spanish. The Elementary Immersion guide received a five star review on MERLOT2. Chapter One: “Language Learning Strategies,” defines and describes learning strategies. It includes a chart of twenty learning strategies and their definitions, followed by detailed descriptions and examples of meta-cognitive and task-based strategies. Chapter Two: “Teaching Students to Think about Learning” explains how to use a story, personal anecdote, or play to teach elementary-school students about Strategic Thinking. Chapter Two also describes techniques that establish a learner-centered classroom. Chapter Three: “Teaching Learning Strategies,” presents the principal elements and theoretical organization of learning strategies instruction using the teaching sequence identified in the CALLA framework. It also shows teachers how to write a learning strategies lesson based on the CALLA model. This model is a language and content learning approach that incorporates learning strategies instruction. Chapter Four: “The Scope and Sequence for Learning Strategies Instruction,” outlines the purpose and development of the scope and sequence for learning strategies instruction in the elementary immersion setting. It is a useful tool for selecting strategies appropriate for your students’ grade and language level. Chapter Five: All of the “Sample Learning Strategies Lessons” identify their grade level, content area, and content strategy as well as their language, content, and learning strategies objectives. Many include both a new and a review strategy appropriate for the grade level in order to illustrate how you can integrate more than one strategy at once. The final chapter, Chapter Six, includes a short review of the literature on language learning strategies. The Appendices contain further resources for teachers. Appendix B details and provides an example of how to adapt a story to teach learning strategies. Appendix C: “Stories for Strategic Thinkers: An Annotated Bibliography” is a descriptive list of stories to help teach learning strategies, while Appendix E provides suggestions for play activities with associated learning strategies and academic applications. 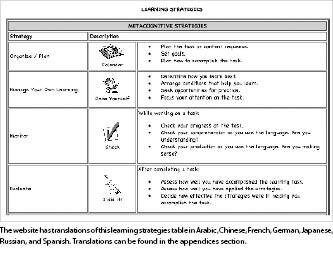 Additionally, Appendix F provides a template to help you develop your own content and language-based learning strategies lessons while Appendix I has learning strategies charts in Arabic, Chinese, French, German, Japanese, Russian, and Spanish. Finally, the worksheets for learning strategies instruction provided in Appendix J are helpful in creating a learner-centered, strategic thinking classroom.